As I mentioned in a previous post, now that my hair is longer, I want to try more styling. To help me out, I have a number of stylers in my stash that I am trying out to help me firm up my staples. 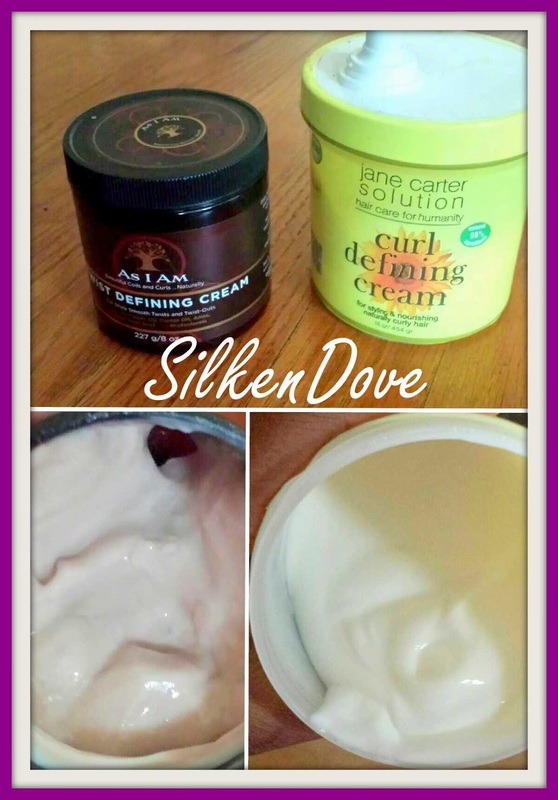 My first comparison is with two of my heavy hitters -- Jane Carter Curl Defining Cream and As I Am Twist Defining Cream. Price: As I Am wins, but not by much. These are both on the pricey side, but Jane Carter is more expensive without a sale. Jane Carter is $34 for 16 ounces, while As I Am is $22. However, for the past two years, Jane Carter has been 40% off during their Black Friday sale or 30% the days after, bringing the price down. Tomorrow, they are having a 50% off sale for 4 hours. Other retailers sometimes follow suit. For example, as of this post's publication, Jane Carter is on Amazon for $23.50. Of course, retailers that sell As I Am have sales too, but I haven’t seen one with that high of a percentage. Consistency: Jane Carter wins for me. Jane Carter is a creamy consistency, like a heavy lotion. As I Am is more jelly-like. Imagine if you mixed cream with a thick gel, like Eco Styler. As I Am is also sticky and leaves a weird residue on my hands. The stickiness is odd because it has little hold. Ingredients: Jane Carter wins this one for me too. Both have infused water as the first ingredient. Looking past the water, the next 5 key ingredients on my Jane Carter jar are Shea Butter, Jojoba Seed Oil, Avocado Oil, Vitamin E and Glycerin (in that order). The ingredients on the website are different. In As I Am, the next 7 key ingredients after infused water are Glycerin, Acetamide MEA, Sunflower Seed Oil, Castor Seed Oil, Triethanolamine, Coconut Oil and Shea Butter (in that order). Depending on how your hair reacts to Glycerin and the weather, Jane Carter may be better because glycerin is lower on the ingredient list meaning there is a lower concentration of it. Acetaminde MEA is also a humectant. Michigan winters can be very drying, so Jane Carter is the better pick for me for year-round use for this reason alone. The fact that As I Am has two amines (Acetamide MEA and Triethanolamine) also makes me a little uneasy because they can be cancer-forming when mixed with other products, like DMDM Hydantoin. Styling: This is another Jane Carter win, but not by much. I’ve tried both for twists (flat twists & box twists) and wash n’ gos, and they both work for both. Both leave my hair soft and get the job done. However, with As I Am, the biggest issue for me is the weird sticky feeling it leaves on my hands while styling and the coating it leaves on my hair. Also, if I use too much As I Am, then residue shows up in my hair. This might be ok if As I Am actually had some hold to it, but it doesn’t. Also, I find that my hair stays a moisturized just a little longer with the Jane Carter. Final Ruling: In a head to head comparison, Jane Carter’s Curl Defining Cream is my preference, but not because As I Am’s Twist Defining Cream is a bad product. I just like Jane Carter’s cream better for my hair.